Click (HERE) To Be Redirected To Entire Photo Album. The Archbold Bluestreaks had their sights set on a third straight ACME state championship when they faced Bryan on Tuesday night in the ACME title game. But Connor Lemons pitched a gem on the mound for Bryan, allowing just six hits as he threw a complete game shutout to lead the Golden Bears to a 3-0 win and their first ACME state championship since 1996. Archbold had numerous chances to take an early lead but were turned away as the game was 0-0 entering the fourth inning. Bryan would score their first run of the night in the bottom of the fourth when Benny Roebuck hit a two-out double to drive in Nate Miller, who singled to start the inning, and the Golden Bears had a 1-0 lead. The Bluestreaks threatened again in the fifth, but Lemons would induce a strikeout and groundout to end the inning. Bryan added two more runs in the bottom of the sixth with an RBI single by Logan Clemens and then Roebuck executed a perfect bunt down the first baseline with the bases loaded that allowed the runner from third to score and make it 3-0 Bryan going to the seventh. Things would get interesting in the seventh as Jeron Williams connected for a ground rule double and Kade Kern later walked to bring the tying run to the plate for the Blue Streaks with two outs. Lemons was able to get Mitch Grosjean to fly out to center to end the game and secure a state championship for the Golden Bears. Lemons, who struckout one and walked four in his seven innings on the hill, was named the state tournament Most Valuable Player. 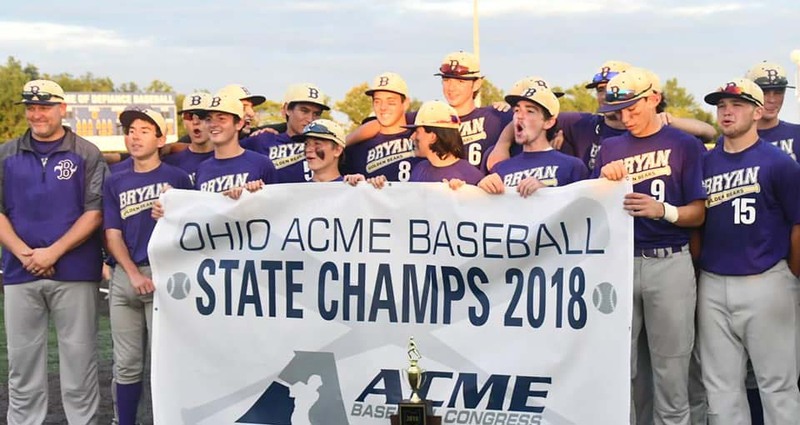 Be the first to comment on "Bryan Knocks Off Archbold 3-0 To Win ACME Baseball State Title"